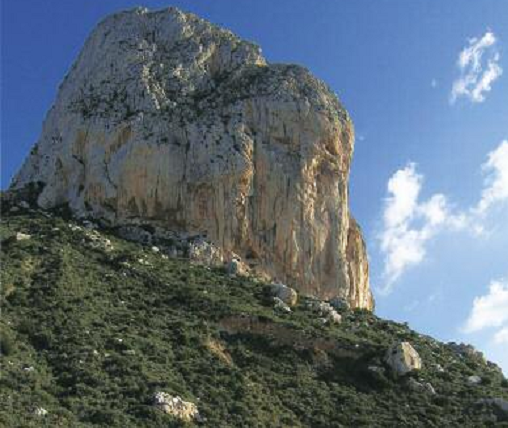 Calpe, in the shade of a giant rock. At the foot of the Natural Park of Penon of Ifach, where the footpath begins, we find a beautiful pebble beach named the Raco Cove. It is south-southeast orientated, sheltered from the east winds, and has an exceptional quality of both visibility and marine life, making it an ideal place for simple dives. Recommended for entry-level divers. Entering from the beach side and following the left wall, heading about 180 °, we find a bottom of shallow depth which has many rocks on the left and sea grass on our right. The bottom descends gently and when it reaches about five meters depth a big clearing of sand shows up among sea grass, we will follow it and turn to the right, heading approximately 220 °. After a short distance we are at seven meters depth and there we will see the remains of a fishing boat, among which there are usually some Groupers and Eels. It’s worth taking some time to visit these remains and after that we return to the left wall and keep heading south until we can see that the rocks disappear and are replaced by sea grass. Then we move a little bit to the right until we will see other rocks, this time larger and more dispersed. 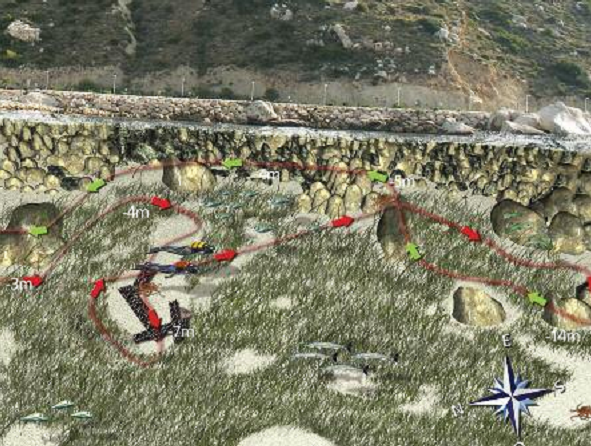 We reach a final large stone at 14 meters depth where we will reverse the direction and begin the return. When the rocks appear again, this time to the right, we pass above them, at a depth between six and three meters where we can entertain ourselves between the countless crevices and gaps, among which there are plenty of Sea Bream, Blennies, Gobios and Nudibranchs … And we finally reach the starting point. Diving with snorkel equipment is always a nice alternative that will allow us to enjoy the bottoms of this unique dive. We can hover above the disordered rocks that form the left wall of the cove, where the bottom does not exceed two or three meters, but that holds a good amount of marine life such as Hermit Crabs, Blennies, Bogas, Sea Bream and Damselfish. With a keen eye you may find some Octopus or Cuttlefish and even a little shy Moray. We can spend a long time going along this simple and accessible path. We must then come back, keeping ourselves very close to the wall, because the depth increases and this makes our visibility more limited.